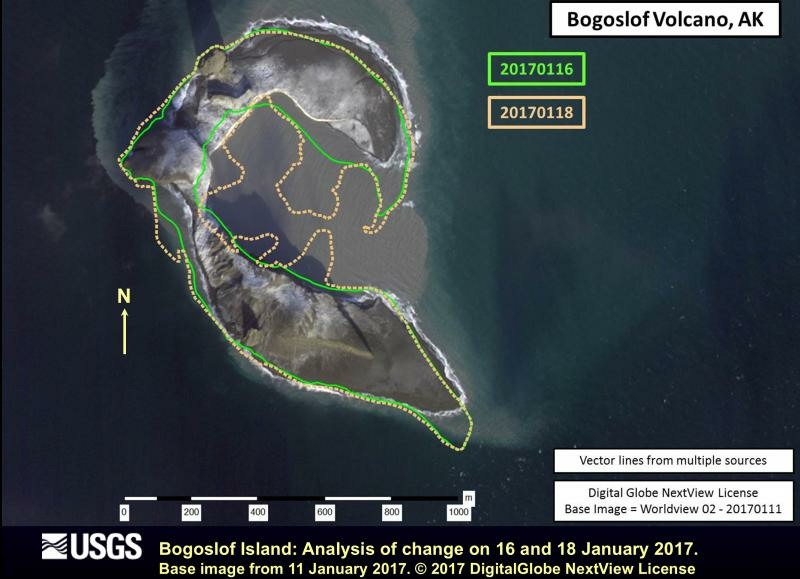 Bogoslof volcano is in an active eruption sequence that began on December 16, though retrospective analysis suggests unrest may have started earlier in December. Eruptive activity has been dominated by a series of explosive events lasting from about 30 to 60 minutes each. These explosions have occurred on December 16, 19, 20, 21, 23, 26, 28, 30, January 2, 3, 5, 8, 12, 15, 17, and 18 (local time). The intensities of these explosions have varied. Eruptions on December 21 and 26 produced water-rich and relatively ash-poor volcanic clouds that rose as high as 10.7 km (35,000 ft) above sea level and were tracked in satellite images as they were transported with the prevailing winds. Sulfur dioxide gas clouds from many of these events have been detected in satellite data, and the event on December 21 was tracked in satellite data for five days to a location over the central United States (Nebraska). Pilots reported that the January 18 (13:20 AKST; 22:20 UTC) ash cloud reached a height greater than 9.5 km (31,000 ft) above sea level. Satellite observations just after the January 18 (13:20 AKST; 22:20 UTC) event showed an ash cloud darker in color, and presumably more ash-rich, than others in this eruptive sequence, suggesting the presence of very hot material (lava) at the surface immediately surrounding the vent - the first such observation during this eruption sequence. The Alaska Dispatch News reported that the January 18 ash cloud affected at least three of four flights at a minimum (https://www.adn.com/alaska-news/aviation/2017/01/19/another-bogoslof-eruption-sends-ash-over-alaska-peninsula-kodiak-island/). Near-real-time satellite data are being used to detect explosive eruptions, to estimate volcanic cloud height and to track the dispersion of the resulting volcanic clouds. These data can also detect highly elevated surface temperatures from lava effusion or hot ash deposits, but none have been observed to date. Data from the World Wide Lightning Location Network provide near-real-time automated alerts of lightning strikes near Bogoslof that have been shown to be indicative of explosive activity at the volcano. AVO will continue to provide timely warnings of activity to the best of our ability and will issue Volcanic Activity Notices (VANs) and Volcanic Observatory Notices for Aviation (VONAs) as needed. If the eruption continues, it is possible that a new cone of rock and ash will continue to grow and rise above sea level. If future eruptions occur above water, the resulting ash clouds may be less ice-rich, which could result in less lightning, decreasing AVO’s ability to quickly detect the presence of an ash cloud. Such eruptions could also become more ash-rich than the previous eruption clouds without significant interaction with seawater that increases ash removal. If this occurs the probability of ash fall on neighboring communities (Nikolski, Unalaska, Akutan) may increase. AVO provides model outputs that predict ash fall and ash cloud information based on either hypothetical or actual eruption information on our website’s Bogoslof Activity Page (https://www.avo.alaska.edu/activity/Bogoslof.php). For official forecasts of ash cloud movement or ash fall, however, we refer you to the Alaska Aviation Weather Unit or the National Weather Service forecast office. Bogoslof Island is the largest of a cluster of small, low-lying islands making up the summit of a large submarine stratovolcano. The highest point above sea level prior to this eruption was about 100 m (300 ft); however, the volcano is frequently altered by both eruptions and wave erosion and has undergone dramatic changes in historical time. The two main islands currently above sea level are Fire Island and Bogoslof Island, both located about 98 km (61 mi) northwest of Unalaska/Dutch Harbor, 123 km (76 mi) northeast of Nikolski, and 149 km (93 mi) northeast of Akutan. The volcano is situated slightly north (behind) the main Aleutian volcanic front. Bogoslof volcano is within the U.S. Fish and Wildlife Service Alaska Maritime National Wildlife Refuge and is habitat for marine mammals and seabirds.